So I was a little sad when I took a look at the board this morning and saw @captainaggie1 listed under today's birthdays. According to the info entered it says he would have turned 68 today. I can't help but be reminded of the number of games, amount of traveling, and personal effort he and his wife put into supporting Aggie Athletics. I remember many times being down about our current situation in a game only to look over and see Captain Aggie (Andy) standing and pumping his fist or a pom pom and encouraging everyone to join him in a cheer in an effort to pick up our team. I also find it quite ironic (or not at all) that the year after his passing, both the football and basketball teams experienced incredible seasons. Did we get a little help from the other side? 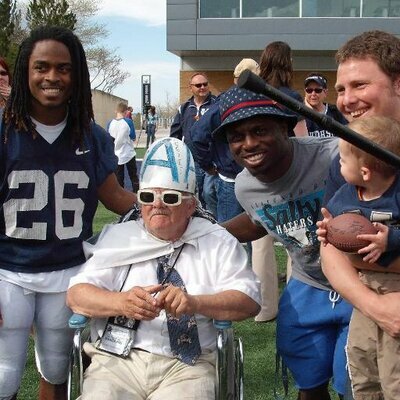 I imagine him joining Wayne, Merlin, our own AggieSports, and all the great Aggie players and fans that went before him as they look down and smile at what has become of both programs. I sat pretty close to his family for the 2017 season. I came back to Utah a year too late to get to know him, though. I think this year I'll be making a concerted effort to meet some of the great fans. Overalls Guy, I've got you in my sites. BigBlueDart wrote: I sat pretty close to his family for the 2017 season. I came back to Utah a year too late to get to know him, though. I think this year I'll be making a concerted effort to meet some of the great fans. Overalls Guy, I've got you in my sites. He’s my neighbor, as in I can see his house right now. If you need an introduction let me know. I loved when he'd come over to the student section during the dark years of 2008-10ish. He'd come over, be all excited, and brighten up the 100 or so of us who were still sticking it out to watch our team lose. It always made the afternoon or evening feel a little brighter. My favorite Captain Aggie memory though was in 2012 during the 4th quarter of a game vs. NMSU where we were up by a lot and this would become our 6th win to make us bowl eligible. He yelled to us, "Let's hear it everyone! Let's hear it for six wins! Six win! I remember when it used to take use 3 years to get six wins and now we're going to a bowl game!" Good guy. I wish I'd have gotten to know him on a more personal level, but I always appreciated his presence. The last football home game he would ever be alive for was the New Mexico game we lost on the terrible offensive pass interference call, and he would be shown after the touchdown that was called off. Seeing that still pisses me off!! Thank you! I really appreciate the post missed my dad a lot at the tournament but all his boys got together to make it to the tournament.